We are always interested in buying good lumber . Our Air Drying Sheds will hold about 6,000,000 board feet and we like to keep them full year-round. We don't try to time the market or the seasons, we want our inventory to be 110% all the time. Sirianni Hardwoods' reputation for producing superior quality lumber starts with the lumber they buy. The sawmills are the key to our business. 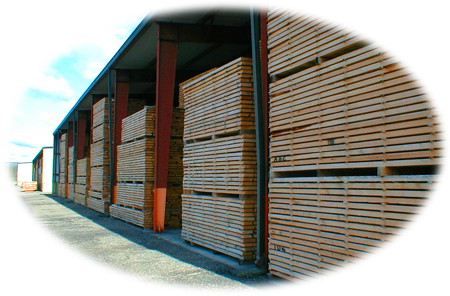 We concentrate on thick Red and White Oak lumber from the best mills. We also buy other Northern Appalachian Hardwoods. We pay a bit more for our lumber, but if you demand high-quality, you have to pay for it. Sirianni Hardwoods deals with sawmills throughout the Appalachian and Allegheny Mountain producing region. Their location at the junction of Interstate 86 and Route 15 provides excellent access for flatbed trucks. Sirianni Hardwoods supports the Principles for Sustainable Forestry. Its goal is to ensure that future generations will have the abundant forests we enjoy today. To discuss your sales arrangements, contact Tom Armentano at tom@siriannihardwoods.com or Jim Sirianni at jim@siriannihardwoods.com.